The yellow foot-printed path is their goal and the gauntlet is the prize. Parris Island, South Carolina is a place where boys’ dreams are realized. Soon, these young recruits meet once again in the same Platoon. Where once stood childish opposition. to prove to each recruit that this is what he seeks. to behold those who were once children. Throughout the silence, our pride does radiate. boys and girls walked separately down the yellow path. of the carefully woven tapestry of laws and promises of our forefathers. Our sons and daughters with Red, White, and Blue dreams. The following statement was released by the family on September 2, 2010: “The U.S. Marine Corps contacted Mr. and Mrs. Twigg early Thursday morning to inform them that their son, Joshua T. Twigg, was killed by hostile fire in Afghanistan. Josh was proud to serve his country as a Marine, having served previously in Iraq two years ago, and volunteering to be deployed to Afghanistan. Josh’s family asks for your prayers as they grieve the loss of this fine young man who was loved by his parents, longtime girlfriend, brothers, sister, nieces and nephew, as well as his extended family and community of friends who knew and loved him. Please respect their privacy as they mourn.” The release was read by LCpl Twigg’s uncle. The Defense Department reported that Twigg was a fire team leader assigned to 2nd Battalion, 9th Marine Regiment, Regimental Combat Team 7, I Marine Expeditionary Force Forward. 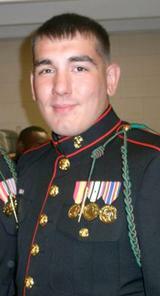 He joined the Marine Corps in July 2007 and was promoted to lance corporal May 1, 2010. Twigg previously deployed in support of Operation Iraqi Freedom from September 2008 to April 2009 and, most recently, to Afghanistan in support of Operation Enduring Freedom in July 2010, according to the DOD. His awards include the National Defense Service Medal, Iraq Campaign Medal and the Global War on Terrorism Service Medal. LCpl Twigg attended schools in Clymer, Pennsylvania and graduated from Penns Manor High School in 2007, prior to entering the United States Marines. He loved spending time with his brothers and his family. He enjoyed fishing and hunting and was proud to be a Marine and serve his country. Friends were received at Moriconi Funeral Home Inc., in Northern Cambria. Funeral service will be held at 11 AM Friday, September 10, 2010, at St. Nicholas Community Center, in Nicktown, with full military honors by the U.S. Marine Corps. —Godspeed LCpl Twigg. CAMP LeJEUNE — TWIGG – LCpl Joshua T., 21, Camp Lejeune, formerly of Northern Cambria and Clymer, entered eternal life while defending his country in Afghanistan. Born Oct. 1, 1988, in Indiana, son of Randy B. Sr. and Terri (Foister) Twigg. Preceded in death by paternal grandparents, Donn Sr. and Norma (Lockard) Twigg and Caroline “Ann” (Pearce) Foister; three uncles and two aunts. Survived by his parents, Northern Cambria; brothers, Randy Jr. (Danielle), Clymer; and Aaron (Lauren), Revloc; sister, Carolyn Twigg, Northern Cambria; high school sweetheart and longtime girlfriend, Christina “Chrissy” Young, Clymer; nephew, Joshua Ryan Twigg; and nieces, Emmy Marie Twigg, Nina Marie Twigg and Alaina Renee Twigg. Also survived by numerous aunts, uncles and cousins. Josh graduated from Penns Manor High School in 2007, enlisted in the U.S. Marine Corps and stationed at Camp Lejeune, Unit 29. Josh loved spending time with his brothers and his family. His hobbies were fishing and hunting. Josh was proud to be a Marine and serve his country.